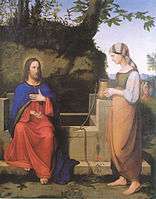 The Samaritan woman at the well is a figure from the Gospel of John, in John 4:4–26. In the traditions of the Eastern Orthodox Church, she is considered to be a saint, named Photine or Photini/Photina (the luminous one, from φως, "light"). 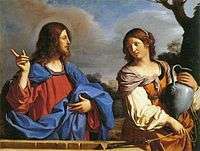 The Gospel of John, like the Gospel of Luke, is favourable to the Samaritans throughout, and, while the Matthaean Gospel quotes Jesus at one early phase in his ministry telling his followers to not at that time evangelize any of the cities of the Samaritans, this restriction had clearly been reversed later by the time of Matthew 28:19. Scholars differ as to whether the Samaritan references in the New Testament are historical. One view is that the historical Jesus had no contact with Samaritans; another is that the accounts go back to Jesus himself. Note that in Acts 1: 8, Jesus promises the apostles that they will be witnesses to the Samaritans. 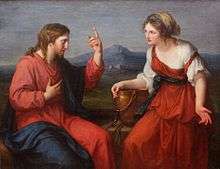 Scholars have noted that this story appears to be modelled on a standard betrothal scene from Hebrew scriptures, particularly that of Jacob in Genesis 29. 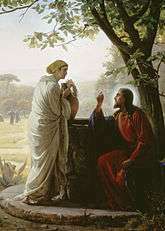 This convention, which would have been familiar to Jewish readers, is subverted by presenting Jesus as the bridegroom of the Jewish people, in a scene which follows on from a scene in which John the Baptist compares his relationship to Jesus with that of the friend of a bridegroom. 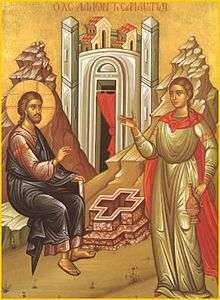 In Eastern Orthodox Church tradition, her name at the time of the meeting with Jesus is unknown, though she later received the name Photini in baptism. She is celebrated as a saint of renown. As further recounted in John 4:28-30 and John 4:39-42, she was quick to spread the news of her meeting with Jesus, and through this many came to believe in him. Her continuing witness is said to have brought so many to the Christian faith that she is described as "equal to the apostles". Eventually, having drawn the attention of Emperor Nero, she was brought before him to answer for her faith, suffered many tortures, and died a martyr after being thrown down a dry well. 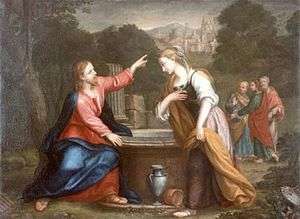 She is remembered on the Sunday four weeks after Pascha (Easter), which is known as "the Sunday of the Samaritan Woman". 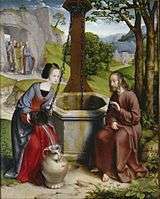 In Oaxaca, Oaxaca, Mexico, a celebration of the Samaritan woman takes place on the fourth Friday of Lent. Churches, schools, and businesses give away fruit drinks to passers by. 1 2 Lincoln, Andrew T. (2005). The Gospel According to Saint John. Peabody, Mass. : Hendrickson Publishers. pp. 170–1. ISBN 1-56563-401-2. OCLC 61129929. Retrieved 3 June 2013. ↑ V. J. Samkutty, The Samaritan Mission in Acts (Library of New Testament Studies 328; A&C Black, 2006), 81; online: https://books.google.com/books?id=g_VSm2aOm4UC&pg=PA81 accessed 19 Oct 2015. See also Alan David Crown, Lucy Davey, and Guy Dominique Sixdenier, eds., Essays in Honour of G.D. Sexdenier: New Samaritan Studies of the Société D'études Samaritaines (Studies in Judaica 5; Sydney: Mandelbaum / University of Sydney, 1995), 134. ↑ Ferguson, Everett. Backgrounds of Early Christianity. Wm. B. Eerdmans Publishing. p. 534. ↑ V. J. Samkutty, The Samaritan Mission in Acts (Continuum, 2006) page 85. ↑ V. J. Samkutty, The Samaritan Mission in Acts (Continuum, 2006) page 100-101. ↑ Kevin Quast, Reading the Gospel of John: An Introduction (Paulist Press, 1991)page 29. ↑ Pontifical Council for Culture; Pontifical Council for Interreligious Dialogue (2 March 2003). Jesus Christ the Bearer of the Water of Life: A Christian reflection on the "New Age". Vatican City: Internet Office of the Holy See. ↑ Barrett, C. K. (1978). The Gospel According to St. John: An Introduction With Commentary and Notes on the Greek Text (2nd ed.). Philadelphia: The Westminster Press. p. 12. ISBN 0-664-22180-7. Retrieved 3 June 2013. ↑ "La Samaritana 2011 en Oaxaca" (in Spanish). Vive Oaxaca. Retrieved 3 June 2013.